Mopti is located at the confluence of the Niger and Bani Rivers. The region has a long history of habitation, but the contemporary city dates to the nineteenth century during the period of the Fulbe revolt against the Segou Babara State. The city was later taken by the forces of Hajj Umar Tall and then by the French expeditionary forces. Today Mopti is a vibrant port and the fourth largest city in Mali. Like Mali's capital Bamako, which was positioned on a key point of the West African railroad system, the growth of Mopti is closely linked to the expantion of the French colonial administration. When French forces reached Mopti at the end of the nineteenth century, they noted its potential as a strategic port. They soon built up the town infrastructure as a base for expansion to the north. By 1914, Mopti replaced Djenne as the regional administrative center of the colonial government. The French in turn put great effort into developing an urban infrastructure, including construction of the dykes and small causeways linking the islands to the mainland. M. Cocheteaux, the French Resident Administrator of the Mopti region, directed the construction of the Great Mosque in 1935. This new mosque was built on the site of a previous one dating from 1908. He is credited with its design as well, basing his efforts on the Great Mosque of Djenne, which had been reconstructed about thirty years earlier. 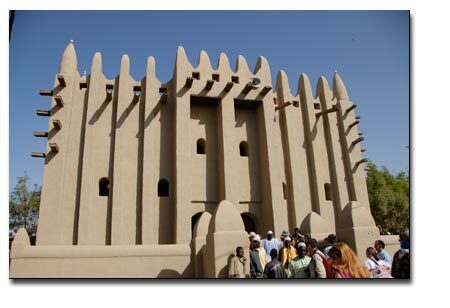 Imitating this "Sudanese" style was a priority for Cocheteaux, but his design is significantly more vertical and symmetrical than Djenne and other regional mosques. The Resident Administrator was also keenly aware of the tourist experience of approaching and viewing the Mosque. Cocheteaux even built two nearly identical facades with this in mind, maintaining the mosque's orientation towards Mecca and its position in the urban environment while creating dramatic views from the city and the river, (see Prussin, 1994 and Bourgeois, 1987 to compare to Djenne). The Great Mosque was listed by the Malian Government as a National Monument in 2005 and restored between 2004 and 2006 under the support of the Aga Khan Foundation. The National Cultural Heritage Department of Mali’s Ministry of Culture, regional authorities, the city of Mopti and the Mosque’s committee directed these efforts. Local master masons and their apprentices executed the restoration work.